Living in Poverty – My Story You spend HOW MUCH on food? The kind of coffee shops I frequent have a well-worn aesthetic that will be some combination of the following: twee/vintage/industrial/dada-esque/retro/postmodern/kitch/European. They will also more than likely have some combination of the following design features: polished concrete floors/high ceilings/mid-century furniture/re-purposed coffee sacks/recycled water bottles/vintage teaspoons/clipboard menus/raw sugar/blackboard paint/recycled timber/mismatched chairs/bare lightbulbs. I say I don’t like trends or fads, but of course the fact is, I like the ones that suit me. And I recognise that an interior of a café aims to communicate a message. The kind of coffee place I’m drawn to says ‘We take our coffee seriously, but we have a sense of humour. Oh and btw, The shot in your macchiato will be really REALLY short.’ Since I want a veeeery short mach, I ‘read’ the vintage/industrial aesthetic as a guarantee of the kind of ‘product’ I want. This marketing works on me. And I appreciate the aesthetic for its own sake, and of course an interior designer knows that that’s exactly what a customer like me will do. So which came first, my longing for a short mach or my love of hipster interiors? A profound question indeed. I’d like to think my love affair with coffee mirrors that of those running the cafés I love and blog, that they get off on the kitch aesthetic as much as I do. I’d like to think it’s not all just a cynical marketing ploy. Perhaps you can tell I’m getting café fatigue. A shame, because my outing to Joe Black in Surry Hills the other day ticked all the boxes. 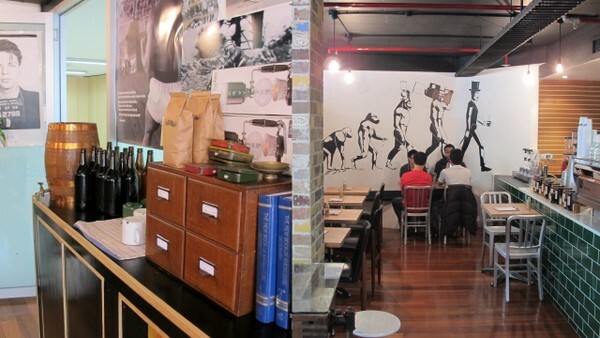 Vintage furniture and teaspoons, moustache logo on the paper cups, right by the Sydney CBD, open Monday to Sunday. Wait, back up, OPEN MONDAY TO SUNDAY? A decent CBD café open 7 days? Maybe I should stop being so cynical. My macch arrives and I’m told it’s an Indian Atiki Single Origin. It’s short and strong and comes with a teensy vintage teaspoon to boot – I almost consider stealing the spoon. Of course the crockery is black, of course I appreciate the attention to detail as we pour our water from old long necks into enamel cups. Notstalgia is so hot right now, and I’m glad it’s so. The only criticism I have comes from my café mate who later tells me Joe Black doesn’t serve juice. Knowing she’s a massive fresh-squeezed juice fan, I sympathise but then she says, no, no juice AT ALL, from a bottle or otherwise; only mineral water, coke, diet coke and ginger beer . I’m usually a big fan of shorter menus and less choice but in some cases, it just doesn’t work. I think not having OJ on a café menu is just…weird. What about you, my first world chums? 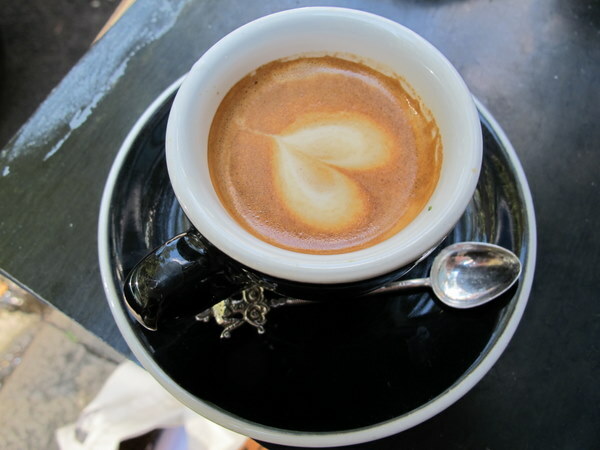 Do you ever get café fatigue? Open 7 days is a big plus. I agree they should offer some sort of “healthier” cold non-caffeinated beverage. I was wondering how long it would take for you to blog this place. I dropped by there about a week after they opened & fell in love with my mac within a minute. Mmmm macchiatooooo!